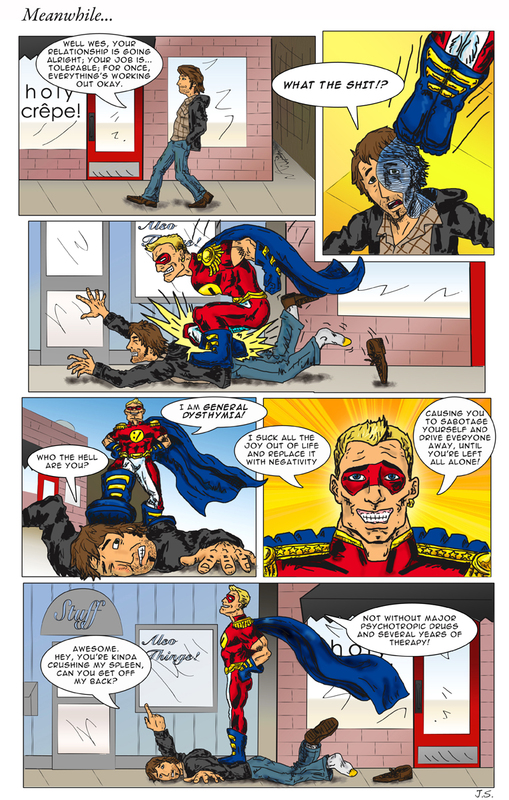 Comic 004: Enter – General Dysthymia! Meanwhile, as Hatlee deals with Blobfish, we turn our gaze to another place, another person, another manifestation of depression. Meet Wes. You may notice the drawing style, inking and coloring has changed a bit. Yes, it’s intentional. Yes, it will change again before it changes back. Don’t worry, this will all tie together eventually. General Dysthymia t-shirts. . .in red. . .no wait capes!!!! love it keep up the good work!